China’s Human Robot Labor Force: The Highest Rate of Surplus Value in the History of Capitalism! I’m writing this short communication to share my observations after watching the 2009 Documentary “The Largest Factory in the World and Chinese Labor” as part of informative article “China and the Restoration of Capitalism. The Largest Cheap Labor Factory in the World” by Professor Michel Chossudovsky. First allow me to point out a few condensed but essential historical marks in regard to China and its late capitalist development after its triumphant Socialist Revolution. Any analysis about China needs to be a conscious one. In general, instead of proceeding from existence to consciousness -a scientific method of investigation- an impatient or confused political economist starts with a subjective reality to examine the actual existence. In this regard, China has been an amazing field test for these economists. They have described the Chinese economy by many names except capitalist. As Professor Michel Chossudovsky explains in the mentioned article, any talk about the restoration of capitalism in China was either “taboo” or rejected harshly as “an impossibility” that “goes against the laws of history”! They argued after all “China was a socialist country” and “it could not be reversed”. In fact since 1949, Chinese leaders had to experiment different economic plans to maintain their power in the backward China as a “Socialist country”. The vast majority of Chinese peasants for centuries were accustomed to literally work with their hands and mainly to feed their families, they rarely had a chance to sell or exchange their surplus produce if any at the farm market. In China, modern agricultural machinery and technology were needed to transfer these scattered rural gardeners to be sufficient producers for a growing economy. At the same time, in order to manufacture equipment in cities, modern factories needed to be built from scratch. Millions of workers needed to be trained to run these factories which in return needed to be fed, housed and paid. Upon this scenario, at the end of the 20th century, Chinese bureaucrats, in order to be relevant as a modern power had to push faster for modernization. They found the solution in inviting foreign investment and encouraging the private sector. The process of the restoration of capitalism in China started in the 1980’s and at the dawn of 21st century it was completed. However, it is needless to say that this new capitalist state was different from the imperialists’ model which was implemented to plunder the resource-rich China before the 1949 revolution. 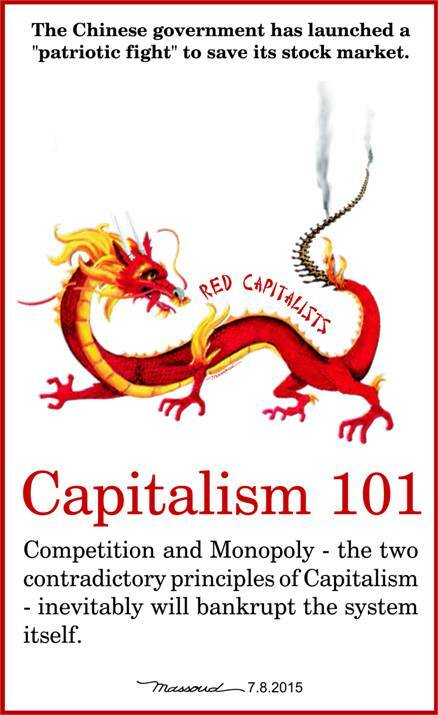 Today, the capitalist dimension of the Chinese state is no longer debatable. Although there are some intellectuals who would like to entertain us with the notion that China represents a new trend in the modern history or as the second economic power is a deterrent force against the U.S. imperialist ambition. The fact is that capitalist China just like its competitors -the Western capitalists – wakes up every morning with a fear of impending foreign intervention and domestic revolt. In the case of China, suppression of the producing forces is extreme. This brings us to the core of my observation from the video about a giant factory in China which is as big as a city! The capitalists in the West have been trying so hard to develop robots that could act like human, however in China they already have succeeded in making humans act like robots! As they say “A picture is worth a thousand words”, this video provides us an opportunity to observe the cruelty of the Red Capitalists against Chinese Workers! After a few minutes of watching the video, we see a factory where the concept of “work” is a constant matter and never stops. We immediately observe that there are yellow parts in the factory, row after row, which don’t look quiet mechanical as fixed tools in the factory, yet in harmony move around in their tiny spaces and assemble parts as have been instructed. They are the workers who have been trained to work hour after hour to make sure their “team” creates the most “surplus value” in the history of capitalism! One might inquire how this is possible. The answer is obvious, while capitalists in the West look for a faster result as financier rather than industrialist; the capitalist China attempts to maximize the manufacturing production scientifically with its vast cheap army of laborer. The video clearly illustrates this fact. In these modern factories, we will find a new generation of workers who are disconnected from the revolutionary heritage and experience of toilers who participated in 1949 Chinese Revolution. The documentary reveals that these giant factories have also introduced the principle of slavery but in a humane framework. Even the most savage slave owner in the U.S. wanted to have healthy slaves who could work longer hours on his plantations. The video shows that the control over the life of workers is not limited to time that workers spend on the floor in the factory. For management the question of healthy productive workers is a real concern. What the workers eat is as important as the quality of products that are shipped out of the factory! In short, as video demonstrates all aspects of workers life is part and parcel of the productivity. Young workers who have passed the initial tests and are hired by the giant factory, become the factory’s unofficial property. They have apartments which are cheap and in walking distance from their work place. In contrast to the factories in the West which are not concerned at all about their workers affairs after they leave the factory facilities; the giant Chinese factories control over the workers is not limited to the duration of the workers punched time cards. They even encourage LOVE and intimate relationships among the workers; the company even pays for group weddings since they believe married couples are more loyal to the factory! However, in general each year the condition of workers in China has turned from bad to worse. The harsh and unsafe working environment routinely takes the lives of the workers. It has been recorded that cheap Chinese products come with the cost of Chinese workers broken bones. The Chinese products are possible only by unbelievable low wages, lack of inherent workers organizations and unions. What this video shows is that workers in China and around the world share the same problems. The workers in Hunan or Houston live in fear of losing their jobs at any moment because of the unstable economy. Meanwhile the Red and White Capitalists both are preparing their massive army for impending wars, at the same time they are passing laws and policies to control their own domestic foe, the working people. Only an independent outlook could open the path to an alternative peaceful solution where production is based on a planned economy that nurture the weak and flourish the potential of a strong society- a system that puts people over profit.